Lighting is an important aspect of our day to day lives and can hold even more weight in certain settings. A major benefit of LED lighting is that it tends to make its surroundings and environment appear brighter and more colorful. You can literally see things more clearly. There’s no better place for these types of benefits than museums and art galleries. Museums and galleries often display great works of art and historic artifacts and clothing, as well as descriptions to read about the items. When using LEDs in these spaces, you are able to see the true and proper colors of the paints, pictures, artifacts, and more. It also helps illuminate the sometimes small and hard to read text that accompanies museum and gallery features. An issue light brings with it is fading, whether that is from natural sunlight or light bulbs. When expensive art and priceless artifacts are at risk, it could mean the loss of preservation or value. LED lighting gives off zero UV rays, meaning anything that is housed under them will not fade due to their light. They also give off a fraction of heat as traditional lighting, another added benefit! To avoid closing a popular exhibit due to burnt out bulbs, install LEDs. Their lifespan of 50,000+ hours saves your maintenance staff time and saves your business money! Last, but certainly not least, is the energy and money saving benefits of LEDs. Museums and galleries require much more direct and designed lighting than simple overhead fixtures. This adds to the cost of your energy bill each month. With LEDs, you can install the same amount of lights while paying only a fraction of the energy bill. Over time, the money savings on the lights will cover the cost of the project itself! Find LED Lighting at Sitler’s! 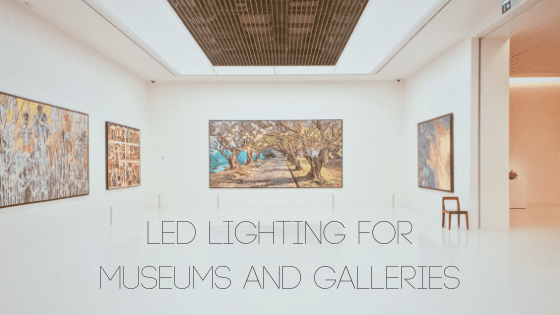 Find the perfect LED lighting solution for your gallery or museum at Sitler’s! Whether you are a local historic home or a small art gallery, we have you covered! Give us a call at (319) 653-2123 or request a quote online!